Have you heard that bike riding is not only a great form of exercise but also an incredible way of making sure that you reduce your carbon footprint? The thing is, not all bikes are right for you. You need to get a comfortable and affordable bike. You want one specifically designed for leisure riding and recreational activities. It should have a particular focus on comfort and performance. What makes the Raleigh Bikes Circa 1 Comfort Bike an excellent choice for most people is that it is easy to adapt, stable and comfortable. It is designed for casual riders, women, beginners, commuters, and children. So, what makes this bike so great? 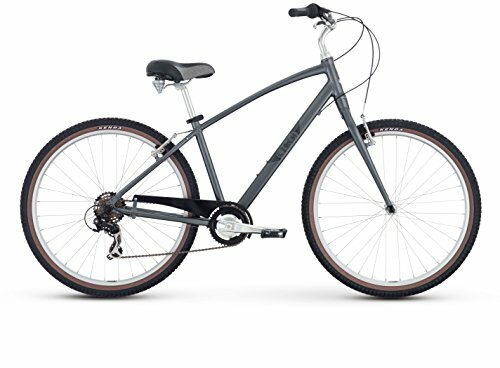 If you are looking for a comfortable bike riding experience, the Raleigh Bikes Circa 1 Comfort Bikes are unbeatable. They are built on the data collected from years of research and riding experiences from bike users. First, the saddle has memory foam and micro-alloy adjustments that allow it to absorb bumps. These features make it ultra-comfortable. Have you been feeling the need to get out of the city and go to the relaxing mountains? Why not ride your bike there? The alloy comfort width of the handlebars ensures that your body is upright. This is great for people who have back issues since this position takes the pressure off your neck and lower back. Is there anything better than having a cool breeze running through your face as you cruise down the suburbs? While a convertible car achieves this effect, it is a much more fulfilling experience when you are on your bike. This bike gives you seven gears. For a beginner, this means that it is a good bike you can start with as you learn to ride and it will still be fun when you are an expert bike rider. You can quickly roll on the flats and tackle those hills with relative ease. As a cyclist, you want to be able to cover as much ground as possible and still conserve your energy so that you can move for longer distances. With multiple gearing systems, you get all round efficiency. This gearing system also means that your bike will not require much maintenance. All you have to do is maintain the chain, keep the tires in excellent condition, and your bike will take you places. If you are not a fan of DIY, assembling a bike may not be your strongest suit. In fact, it may be something you hate. The thing about this Circa 1 comfort bike is that it will come partially assembled. You will have an extremely chance of learning how it works without having to start from the ground up. If you have experience with assembling or are a skilled bike mechanic, you will be riding your bike in 30 minutes. If you are not proficient, you will be riding yours in just 120 minutes. Raleigh is a company that has been providing customers with bikes and is committed to giving you the best quality. The classic steel used to make most parts of the bike ensures that it is sturdy. You do not have to be extremely light to use this one. It is sturdy enough to handle an incredible weight. You also have the freedom to ride through mad without worrying about getting stuck or ruining the bike. The dark grey color is great for both male and female users. There are various reasons why you need to get yourself the best single speed bike. It gives you world-class riding comfort and saves you money. It also gives you an unbeatable class among your peers. This one is sure to suit your riding needs and provide you with value for your money.